Q: Where the heck am I??? I don't think anyone would say the Oasis is known for the food, as it's always been a "drinks and watch the sunset" kind of place, earning the name The Sunset Capital of Texas as it overlooks Lake Travis. A fire, caused by a lightning strike, engulfed the restaurant and their iconic cliffside multi-storied decks in 2005, closing it down. I probably hadn't been out there since the late 1990s, as it's just an area of town I don't get to. And in their defense, I have heard that since the fires, they have been working to elevate the caliber of their food. So imagine my incredible surprise when I drove down Comanche Trail to the rebuilt Oasis compound. It truly is an oasis in the middle of practically nowhere, a phoenix that has risen from the ashes to use another cliche. The road dead ends into a huge Tuscan villa, that encompasses a number of entities -- the Oasis, Soleil, Uncle Billy's Brew and Cue, Austin Java, and some retail shops and galleries. From the part I could see, it's a beautiful looking compound, and I was beyond shocked to see how it's been rebuilt -- it looks fantastic. I attended a media tasting recently at Soleil, the very polished younger sibling of the Oasis, serving "new American" cuisine. Chef Daniel Burton Sanchez is in the process of revising the menu, and he wanted so share some of the new items. I arrived about 7 pm on an overcast day and it had been raining off and on. Coupled with the fact that the sun was going down, I wasn't able to get any great views of the lake or sunset, but I am certain they are there! We began with appetizers in their bar area, called the Azure Lounge. My favorite of what we tasted was the seared foie gras with Sauterne-mulled apple sauce on toasted brioche. Once seated in the dining room, our meal began with an amuse bouche' of veal sweetbreads, chantrelle mushrooms, haricot vert, and a mignonette beet dressing. A nice combo of flavors, the beans were perfectly crisp, and the sweetbreads nicely cooked. The first course was a large seared scallop on a bed of sweet corn risotto, bacon, and an arbol chile oil. The sweetness of the scallop and corn played perfectly with the savory notes of the bacon and the little bit of heat from the chile oil. Probably my favorite dish of the evening! The next course was a pan roasted duck breast, butternut squash and edamame stuffed ravioli, and a pumpkin seed pesto. This was some of the most perfectly cooked duck I have ever had! Moist, tender, and lightly pink inside. It was also well-salted, which for me is usually rare. The third course was braised pork belly on a cilantro parsnip puree. I liked the pork, but I don't think it was as good as the previous proteins! I liked the idea of the puree, but I think it needed a little more acid to brighten the flavors, as it was very earthy. Each course was expertly paired with a different wine by sommelier Melissa Hale, who along with Chef Burton, made themselves available for questions and comments. My dining companion Christy of Epicuriosities put it best when she said "This is now a dining destination!" Soleil has absolutely elevated the stature of restaurants near Lake Travis, and I look forward to going back in the near future. That is a GORGEOUS meal. 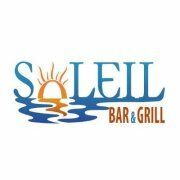 I have thoroughly loved and have been impressed with every bite I have ever had at Soleil. I go there as much as my wallet allows. It is a lovely spot to escape to for a little mental health time--especially by yourself. Was last there for Mother's Day brunch and my mother did backflips over the view and the food. Oooh, I bet the brunch was wonderful! You're right, it IS like a little mental health escape! Pricey, but worth saving up for every morsel. In my opinion, absolutely, one of the best restaurants in Texas. My dates and I have been totally blown away. We have a soft spot for Soleil! Delicious food, great chef, and breath taking views! Wish I could have seen the views, but it was getting dark and had been misty. Oh well, I'll just have to go back!